"Oh, Mr. Paderewski," said a woman to the Polish pianist, "you must have had a world of patience to learn to play as you do." "It's not that at all, my dear woman," replied Paderewski. "I have no more patience than anyone else. It's just that I use mine." Many have said in times past, "Lord, give me patience—NOW!" I'm sure that particular prayer went unanswered. Patience is a virtue that we are to ADD to our faith according to Peter (2 Peter 1:6). 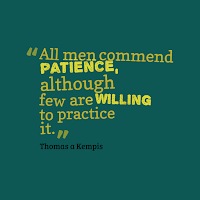 Patience, or the lack thereof, is a trait that reveals one's depth or shallowness of character. 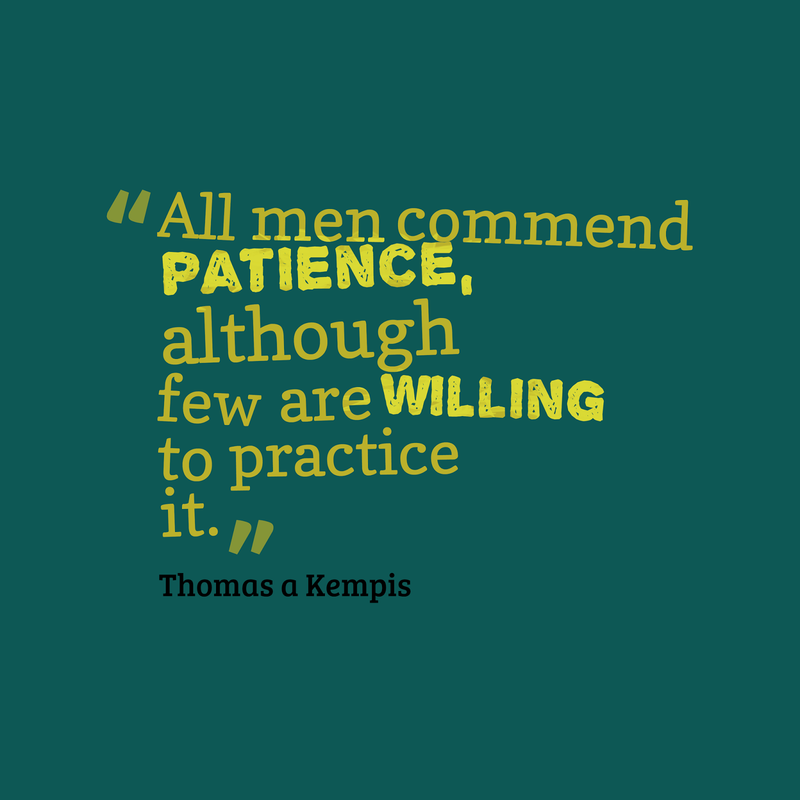 As stated in the opening of this article, patience is something that can be practiced and strengthened. It is something that is our responsibility to possess. If you are reading from a modern translation, then you will try to correct this by saying, "No, Dale. Patience is a fruit of the Spirit as listed in Galatians 5:22." Sorry. They are two completely different words, not even closely related in the Greek. It is unfortunate that the modern translations rendered μακροθυμία (makrothumia) in Gal. 5:22 as patience. Longsuffering is the translation in older versions of the Bible. However, the word "longsuffering" is not in our common language any longer; therefore, a better word was needed. But, "patience" is not it; though of the 14 times the word is used in the NT, it is translated "patience" twice in the KJV (Heb. 6:12; Jas. 5:10). Also, if you are new to this blog, I dealt with the 'fruit of the spirit' in a previous post, where I attempted to show that the passage in Galatians refers to a spiritual life, rather than the Holy Spirit. You might want to read that article if your insistence on "fruit" vs "practice" is still strong. What, then, is patience? Why is it something we should add to our faith? How is that going to help me in my walk with God? Good questions. Thank you for asking. Most people prefer the second definition as their primary understanding of the word—to wait patiently. That is, of course, a valid definition, and one that we, as Christians, would do well to incorporate into our lives. However, it is not the primary definition, nor is it the meaning found in scripture. The first definition is. So, it is not about your ability to stand in line at the grocery store without fussing, nor your ability to relax when the interstate becomes a parking lot. It is not about your willingness to choose the longer line in the grocery store. It is about your ability to not lose your temper. Why Should I add it to my Faith? Obviously, the main reason would be because that is what the verse says that is under our consideration; and we do not want to end up with the afflictions of James 1:22. How Will Patience Help Me? In considering only this one aspect of patience, there are two passages of Scripture that speak to this question—Romans 5:3-5 and James 1:2-4. The Romans passage says that patience works experience into our life. And experience works hope into us. That may be a hard one to swallow, because with or without patience I will have the experience of the tribulation mentioned. But, that is not the meaning of the word 'experience' used here. This is the experience of having gone through something and learned its lessons. Now, you have hope, because you can rely on the outcome of having patience in the experience. A baby cries every time its mother disappears around the corner. For the baby, that is the end of the world. Eventually, however, the baby learns that its mother will soon return into view. So, it learns to have a little patience. With the experience of her re-appearance, there is now hope that the same will occur next time she is removed from sight. James teaches us that the trials and tribulations are a testing of our faith so as to produce patience. Patience is something that must be worked on and worked out in our life, so that we will become "perfect and entire, wanting nothing." That phrase simply means that you have become absolutely complete in Christ with nothing lacking. That is the goal of the Christian life (Eph. 4:13; Col. 1:28). Therefore, the next time you find yourself getting out of sorts in a situation, think about this. Don't let the situation, which is definitely temporary, cause you to doubt or get frustrated in any way. Stay true to your course. You are aiming for the prize of the high calling of God in Christ Jesus (Phil. 3:14). Please consider leaving your response below--either through words, or simply checking the appropriate box below that equals your reaction.